As a collective birthday gift from my girlfriend and my brothers, I got an electric RC airplane, the Apprentice 15E RTF with the Spektrum DX5e Radio included. A pretty big one, I should say. I had to wait for about two weeks before receiving it, and then an extra week and a half before being able to fly it outside due to winds in excess of 12 km/h. These are pretty calm winds, although when starting to pilot RC planes, it is highly recommended to do so in absence of winds. So I did some homework. I purchased a model airplane flight simulator and practiced controlling the simulated plane for a few hours...aka all night long! I was so excited about piloting it perfectly the first time. The only inconvenient was that the controls were routed to keys on the keyboard, as I did not have a dual stick gaming pad, nor any USB transmitter dummy. I recently found out that the DX5e could actually be plugged to the computer through the microphone port. Yes, the microphone audio jack! This was a bit of a shock to me at first, but come to think of it, what the transmitter sends to the plane is nothing but a signal. You see, the only difference between the signal it actually emits to the plane (high-frequency signal like wifi devices use) and the one it outputs to the computer is that one is probably down-sampled to a frequency within the human audible spectrum (low-frequency signal under 22 kHz). This "scaling down" allows the signal to be audible to a microphone. The higher frequency signal will allow a longer range of transmission and facilitate some common issues with radio telecommunications (thus using a 2.4GHz frequency spread spectrum technology). This is how I understand it and I may be wrong, in which case I would gladly appreciate being corrected, as I prefer knowing facts as they are, and not simply as I believe them to be. Anyhow, back to the main point. As soon as the winds got below 6 km/h, I headed out to the closest baseball park I could find. Was I ever excited to make it takeoff and get it up in the air! And so it was, I was able to pull off a perfect takeoff and get it to fly over the baseball field a couple of times, and even make some loops and rolls. But then came the moment where I was starting to get stressed about the landing part of this adventure. The wind was calm, without any gusts to worry about. The baseball field was pretty small after all, I'd have to fly in pretty low over the park adjacent to the baseball field, but not too low since I'd have to fly over the fence surrounding the field. At the same time I had to make sure that the plane was facing the wind straight on while landing, reducing the throttle to a minimum, shutting it off and just gliding to touch down. Everything went great, a little bumpy yes, but great for a first landing. My first flight was a success! Having gained some confidence with this first flight, I decided I should take it on a second flight. And then... a gust of wind followed by a counter-wind or something of the sort. Basically, there must have been a gap of wind that made the plane drop in altitude very rapidly. My reflex was to make the plane go up to gain a bit of altitude because it was still going too fast to touch down. Big mistake, I pushed UP on the elevator stick, thus making the plane peak down towards the ground. Fortunately, this is a foam plane and the foam absorbed most of the impact without breaking. The only casualties were the spinner cone, the motor mount and a few plastic clevises that were holding on to the ailerons and the wheel pivot. Gladly, it cost me only about 20$ to order a new set of the damaged parts. 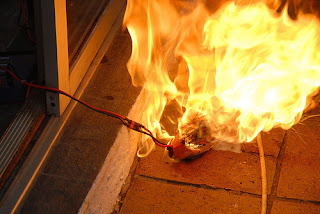 The battery itself, a LiPo battery, got bent slightly, therefore requiring to be quarantined for a while, as this type of battery is extremely delicate and is known to explode and burst into flames quite easily. I can't wait for the next calm, windless day!